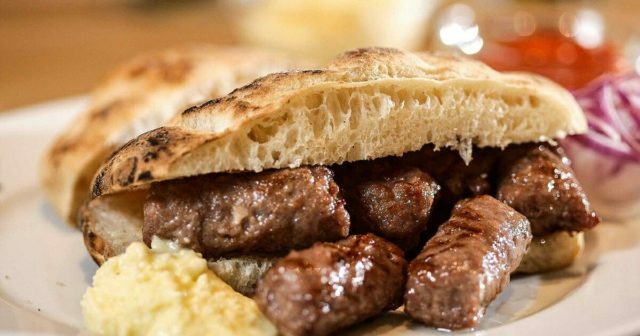 Bosnian ‘ćevap’, a traditional and amongst the most common dishes of the country, has made it to top ten of the World Food Atlas’s top 100 tastiest dishes of the world. The website collecting the information on the most popular and the best-rated food across the globe ranked the Bosnian “tiny, hand-rolled minced meat sausages” as the 7th best-rated dish, leaving behind Japanese sushi and Spanish paella. “Traditionally, one portion of the dish consists of ten pieces of ćevapi tucked in a soft, moist, slightly grilled flatbread called lepinja or somun and a variety of accompaniments such as kajmak, a type of clotted cream spread, roasted red pepper and eggplant relish called ajvar, and raw onions,” said the description.